Mobile office. Dell's business laptop, equipped with the latest Intel Sandy Bridge technology and intelligent detail solutions, tries to hit a home run. Read about the capabilities of the "lower priced" Essential line in Dell's Latitude range here. Dell's Latitude range is aimed at professional users from the business field. The Latitude range is to bid these users robustness, security and be easy to manage. It can also score with many useful detail solutions. No matter if it's the solid tri-metal design, the zinc alloy lock or the powder coated bottom, Dell has been really creative with both Latitude E series laptops. The business customer is also offered quite a bit in terms of hardware. For example, the newest processors from Intel's Sandy Bridge are installed. 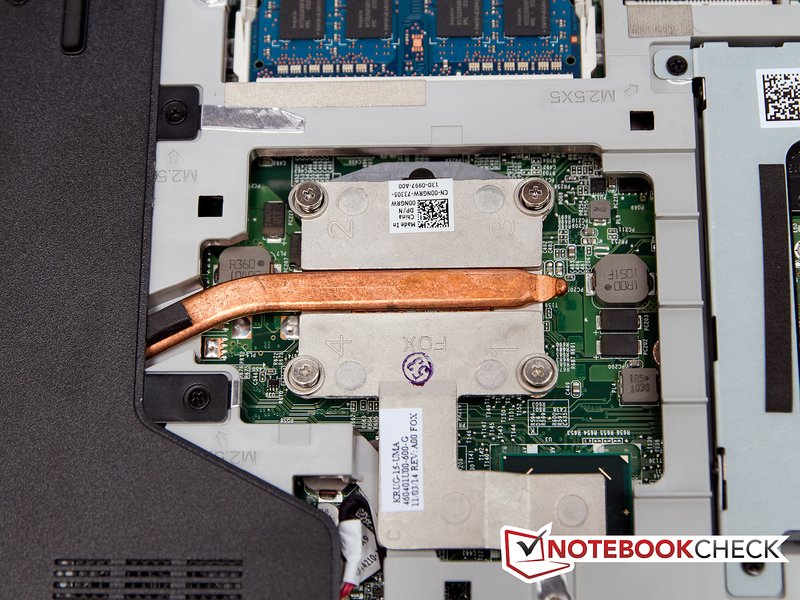 An Intel Core i5-2520M processor works inside our test sample and thus gives the notebook a good deal of power. Additionally, a wide selection of batteries and docking stations provide sensible accessories for the laptop. We took a closer look at the Dell Latitude E5520 with an Intel Core i5-2520M and Intel HD Graphics 3000 card. 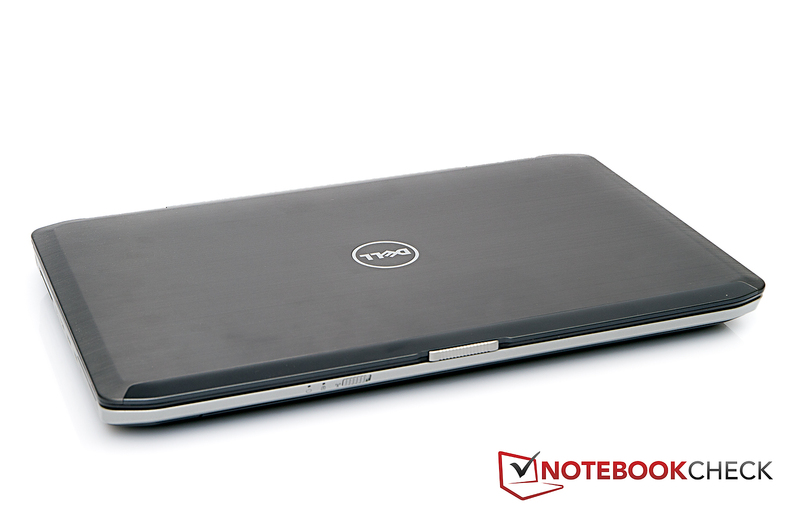 The Dell Latitude E5520's case strongly resembles that of the Dell Latitude E5420 Essential notebook. We had the Dell Latitude E5420 Essential in review a while ago and it looks confusingly similar to the Latitude E5520. The only difference is that the Dell Latitude E5420 Essential is a smaller 14 inch laptop. 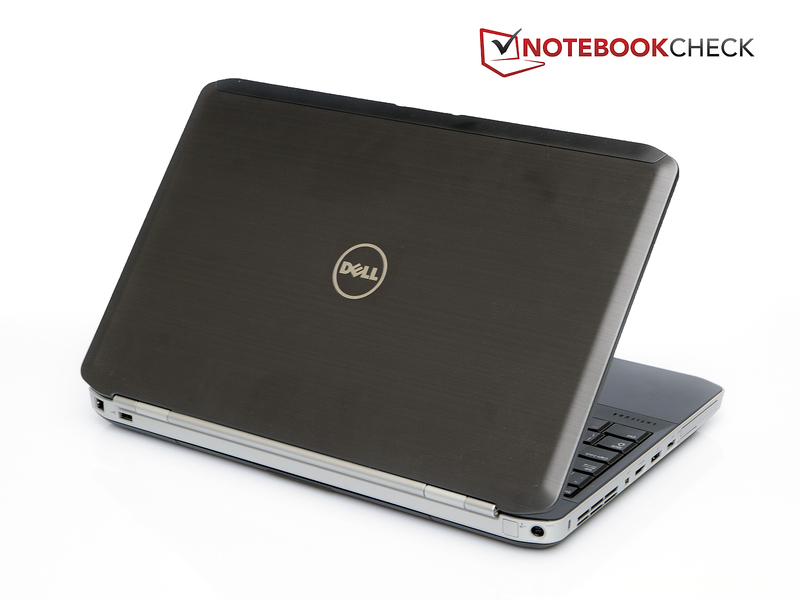 Thus, we'll not go in-depth about design and would instead refer to the review of the Dell Latitude E5420 Essential. 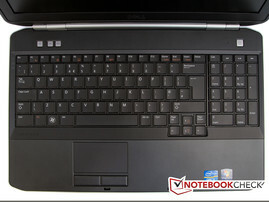 We will also take a closer look at the higher quality model from Dell, the Latitude E6520, at this point. The Latitude E6520 clearly excels the Latitude E5520's case even more and meets the highest requirements. The Latitude E5520's manufacturing quality is nearly perfect. The display lid, made of brushed aluminum, makes a high-end and robust impression. Quite a bit of pressure is needed to twist it. Moreover, the surface is very fingerprint resistant. They have a hard time staying on the display lid. However, fingerprints can be easily removed with a soft cloth should they become visible. The base unit proves to be very stable. The surface doesn't yield a millimeter, not even under strong pressure. It looks different for the keyboard. It can be depressed with little force especially above the optical drive. In return, the display hinges are positive. They are made of metal (not massive) and keep the display firmly in place. It hardly teeters. Very wide opening angles are possible due to the hinge design. The display is kept closed by a zinc alloy lock. 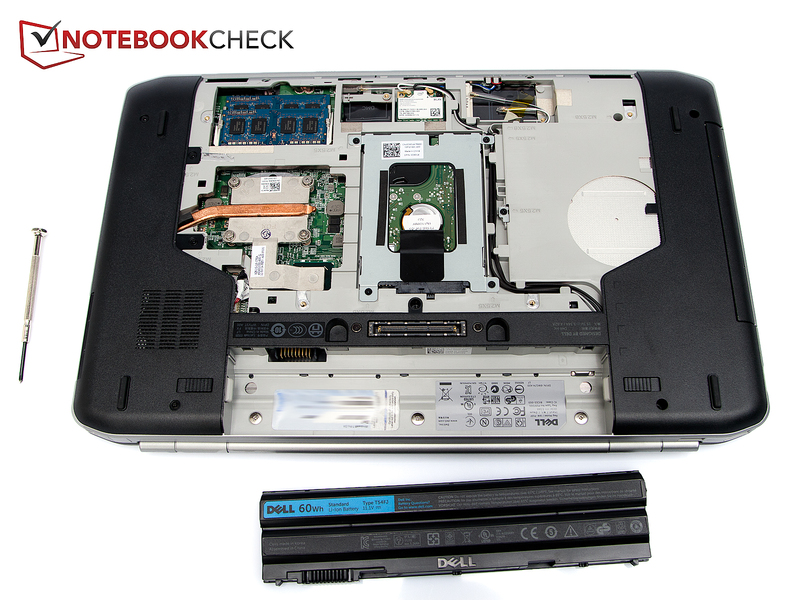 The Dell Latitude E5520 notebook comes with a wide variety of connections. Unfortunately, the notebook doesn't have any cutting edge USB 3.0 ports. Thus, you won't have the pleasure of connecting external hard disks to the laptop via the fast port in the future. At least Dell has installed an eSATA port. However, it can't reach the speeds of the new USB 3.0 interface. Alternatively, you can use the FireWire port for this. It can easily happen that big plugs cover a neighboring port because of the interface arrangement. Dell has namely placed the ports quite close to each other. It can very well happen that a broad USB stick covers the other USB port or even the HDMI socket on the left. 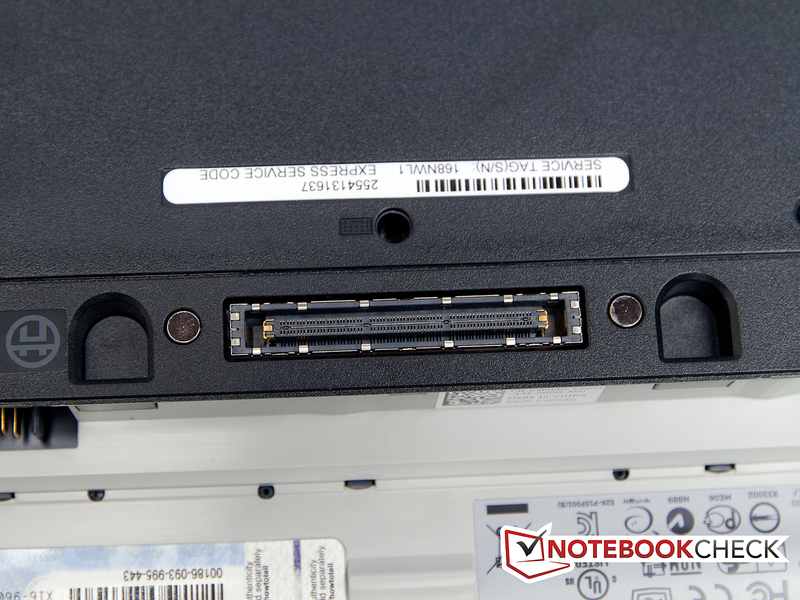 The ExpressCard slot that Dell has given the Latitude E5520 is appreciated. Thus, the notebook has an uncomplicated expansion possibility. Dell also offers two docking stations for the Dell Latitude E5520. First, the Dell Docking Station / Port Replicator (452-10768) for 129 euros and second the Dell Advanced Docking Station / Port Replicator (452-10761) for 149 euros. Both docking stations differ in the number of interfaces. Dell supplies the customer with a range of options for connecting to the world. Our test sample has LAN, WLAN and Bluetooth. There are also models available with a built-in 56k modem and UMTS module. The opening for the 56k modem is available on our test sample, but it's sealed with a small plate. The LAN controller is a Broadcom NetXtreme 57xx Gigabit Controller and the WLAN adapter comes directly from Intel. It is the Intel Centrino Advanced N 6205 adapter that supports 802.11 b/g/n standards. 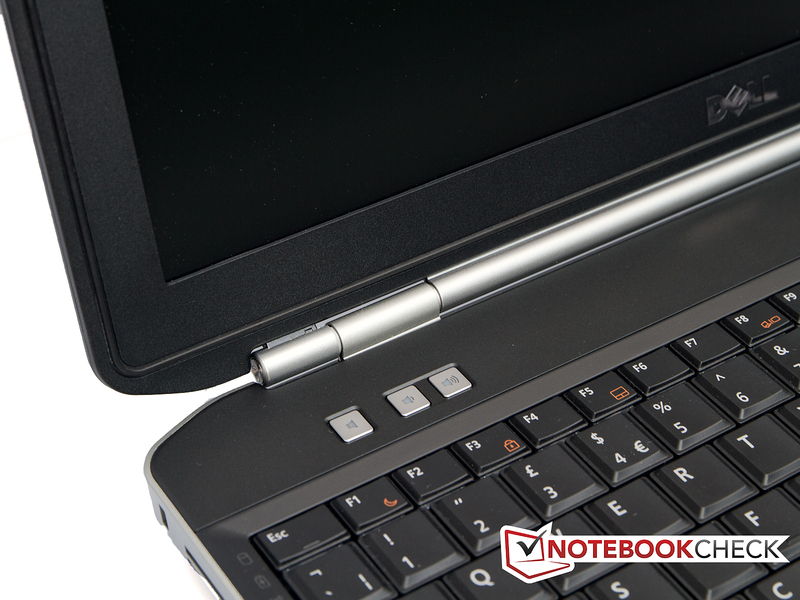 The Latitude E5520 only has a Kensington slot for leashing the laptop to something. There is no fingerprint reader. In terms of software, you are protected against viruses by a software subscription, Trend Micro Worry Free Business Security 3.5 (15 month subscription). The subscription can be extended up to 36 months for an extra charge. Dell additionally provides options for theft security and assets tagging. These options have to be selected while ordering the notebook in Dell's online configurator. Our Dell Latitude E5520 test sample was delivered with an agreeably "clean" Windows 7 operating system. 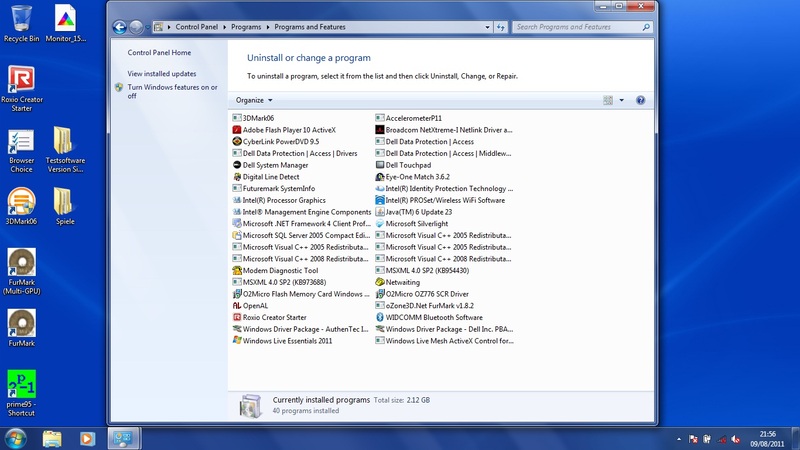 Less than 40 programs were installed on the hard disk. However, Dell also holds back on included programs. They have to be purchased along with the order. In addition to the actual laptop, the adapter including power cable and printed documentation, there is fortunately also a recovery DVD in the scope of delivery. Most manufacturers don't include such a DVD and prefer to create a recovery partition on the hard disk. However, the customer looses hard disk memory. The Dell Latitude E5520 is delivered with comprehensive warranty coverage. Rather than a one or two year warranty, the Latitude E5520 comes with a full 3 year warranty period. This warranty includes an onsite service for the next business day. There are also a number of other services that the customer can order optionally. The list of additional services is long and ranges from a certified data destruction service up to a theft and accidental damage protection. Possibilities for tracing and recovering the laptop are just as available as an extended battery service. The additional bundles validity can usually be extended up to 3 years. The Latitude E5520 excels with its crisp pressure point and good feedback. The keys are sufficiently sized with 19x19 millimeters and will even allow prolific typists who have larger fingers to type comfortably. Dell doesn't use a chiclet keyboard. The keys have a concave surface that is to improve the typing feel even more. This has also been accomplished in our opinion. The keyboard's key bed is basically solid. It only coils a bit under the number pad and over the optical drive when typing. Dell has generally left out hot keys outside the standard keyboard. There are only three buttons for volume control on the notebook. The other special functions are controlled via the FN key. The touchpad has a diagonal of 92 millimeters (80 millimeters x 45 millimeters) and is inserted into a cavity that separates the touchpad from the wrist rest. Navigating with the touchpad is very uncomplicated and reliable. The touchpad's surface is smooth, but not slippery in any way. Both mouse keys beneath the touchpad are especially conspicuous - or better said, especially inconspicuous. The mouse keys work absolutely noiselessly. You don't get any acoustic feedback about the mouse click, but that's not really a flaw due to the good haptical feedback. Dell uses a 15.6 inch LED screen with a resolution of 1366x768 pixels. Fortunately, Dell installs a matt display into the Latitude E5520. Thus, nothing should theoretically stand in the way of working outdoors. Another Dell Latitude E5520 is alternatively available with a matt Full HD screen in Dell's online store (1920x1080 pixels). The surcharge between our test sample and the model with HD display is only 50 euros and also includes a 500 GB hard disk instead of the 320 GB hard disk. The Latitude E5520's screen has a good basic brightness. The screen's brightness is on an acceptable level with an average brightness of 219 cd/m2. The display's even illumination is pleasing. It's close to perfect with 94%. The black value and contrast are far less recoverable. While the black value is high 1.36 cd/m2, the contrast suffers and is only 136:1. That's not particularly impressive and there clearly is need for improvement. Moreover, we noticed that the brightness is automatically reduced in battery mode during our tests. When the laptop is connected to an outlet, the center has a brightness of 222 cd/m2. The rate drops to 181 cd/m2 in battery mode. This results in a brightness loss of almost 20 percent. 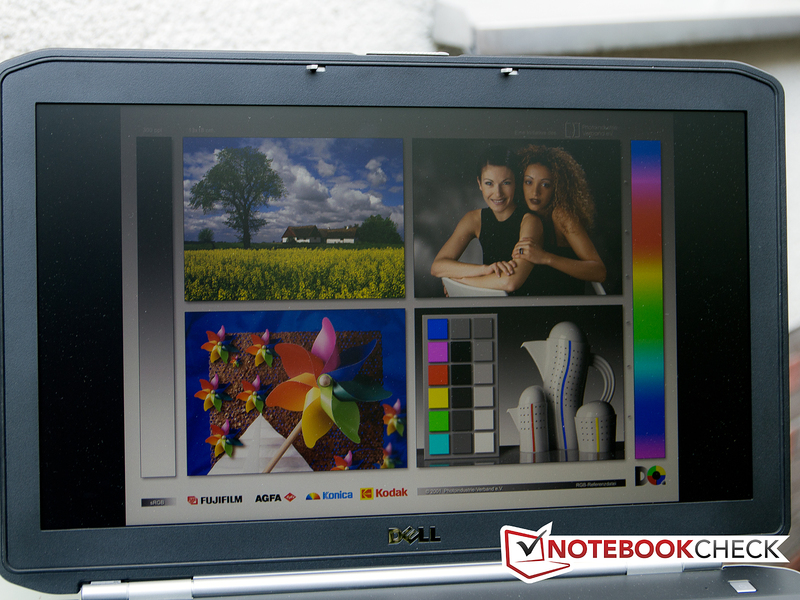 The Dell Latitude E5520's screen can't score in color reproduction, but that's not expected from an office laptop anyway. While we can still determine quite large sRGB coverage, the AdobeRGB color spectrum is remote from being fully reproduced. 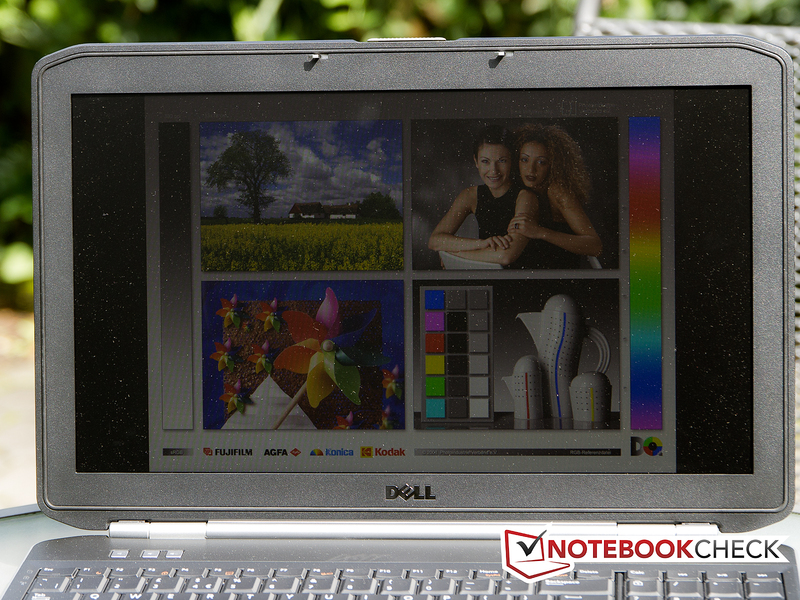 The Dell Latitude E5520 fares very well outdoors. The matt display can show all its strengths here. The difference to a reflective display becomes very clear in a direct comparison. The screen's legibility is excellent in the shade. The legibility decreases a bit in direct sunlight. Nevertheless, the display content remains well readable. 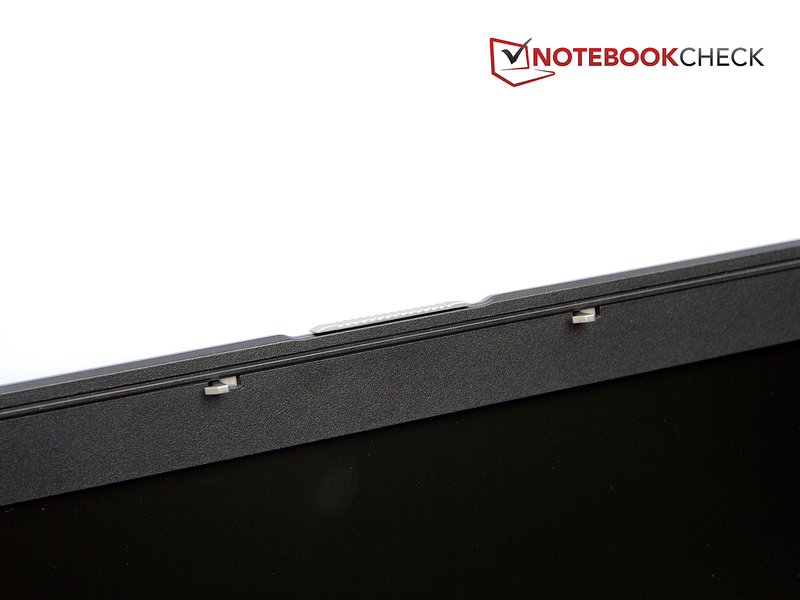 The Dell Latitude screen's viewing angles are as known from comparable displays. There are no problems when looking at the screen from the front, even if you are looking at it with several persons. However, the picture falsifies quickly when the display is tilted up or down. 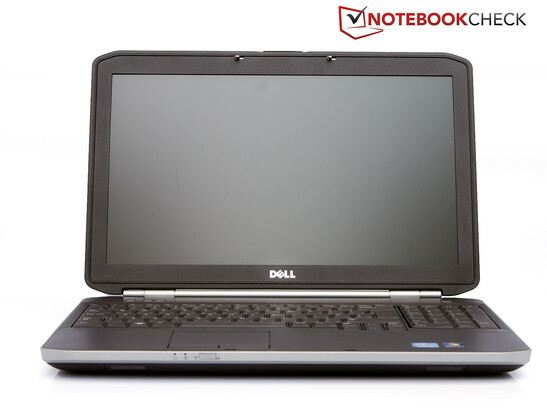 The Dell Latitude E5520 laptop's heart is the Intel Core i5-2520M processor. It is a high-end dual core processor from the current Sandy Bridge family. The processor has quite a bit of power with a default clock of 2.5 GHz. The processor also has the possibility to overclock in various levels should performance get tight. A single core can be overclocked up to 3.2 GHz when required. The clock rate can be increased to 3.0 GHz should both CPU cores be needed. The processor is also suitable for complicated tasks, such as HD video editing or 3D games due to its capacity. The CPU isn't any more demanding than the smaller models with a TDP of 35 watts. However, the Intel Core i5-2520M exploits the 35 watts a lot more than, for example, the Intel Core i5-2410M. The processor is also recommended for laptops with a screen size of 14 inches or more due to its TDP of 35 watts. The Intel HD Graphics 3000 card takes care of displaying the content on the screen. It is embedded directly into the processor and consequently doesn't need additional cooling. Although it's not one of the strongest graphic cards on the market, it can very well compete with entry-level cards, such as Nvidia's GeForce 310M. A major advantage of the Intel HD Graphics 3000 is also sooner the low power consumption than performance. Nevertheless, it's possible to play older games smoothly on the graphics card. A few new games can also be rendered smoothly, but clear losses in resolution and quality have to be accepted. Unfortunately, we had to use the 32 bit versions of our benchmarks programs because only a 32 bit version of Windows 7 was installed on our Dell Latitude E5520, although the laptop is usually offered with the 64 bit version of Windows 7 in the online shops as well as directly at Dell's. We use Cinebench R10 32 bit to determine the processors efficiency. The Latitude E5520 achieves a score of 4059.0 points in Cinebench R10 single rendering (32 bit) and is quite far at the top of our chart. It also fares well compared to other laptops with an Intel Core i5-2520M processor. The gap to the top model, Schenker XMG A501 (2520M, GT 540M), with 4111.0 points isn't very big. The Latitude E5520 also is quite far front with 8820.0 points in the Cinebench R10 multi rendering (32 bit) benchmark. 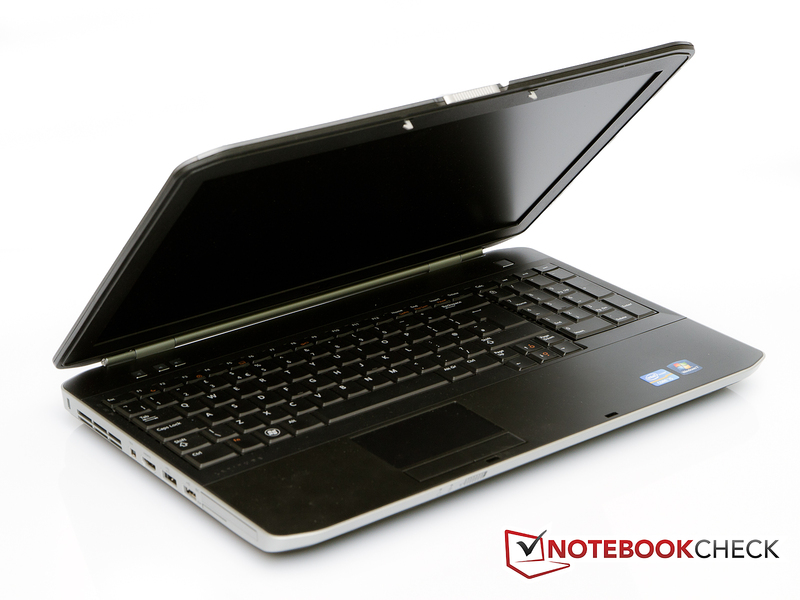 The Latitude E5520 again scores well in comparison to notebooks that use the same processor. The top model with an i5-2520M processor is the Toshiba Tecra R840-11E (2520M, HD Graphics 3000) with 8858.0 points in the Cinebench R10 multi rendering benchmark. Thus, the top model's lead on the Dell Latitude E5520 isn't particularly big. Although the Dell Latitude E6520 has a stronger processor (the i5-2540M), we nevertheless venture a direct comparison of both laptops. The Latitude E5520 doesn't do a bad job. It is always only marginally slower. The Dell Latitude E5520 achieves 7029.0 points in the system benchmark, PCMark Vantage, and is thus in the upper third of the comprehensive chart. Comparable laptops with the same hardware, such as the Lenovo ThinkPad L420 NYV4UGE (2520M, HD Graphics 3000), are positioned at 6601.0 points. Laptops, such as the Lenovo IdeaPad Y560p-M61G3GE (2630QM, HD 6570M) with 6996.0 points, are slightly below the Latitude E5520 notebook. The Latitude E5520 can even assert itself more clearly in our PCMark 7 benchmark. 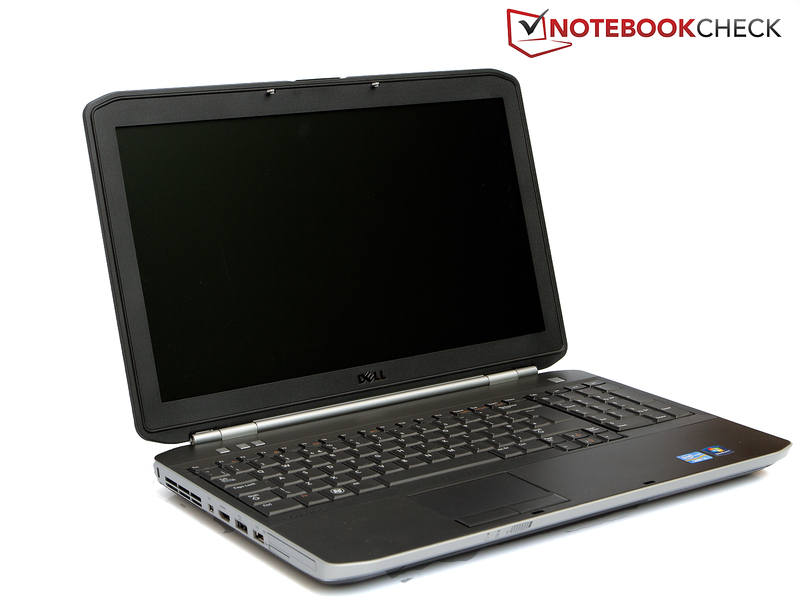 It is the best rated notebook with an Intel Core i5-2520M processor and Intel HD Graphics 3000 card with 2477.0 points. 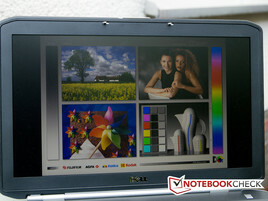 Overall, the Dell Latitude E5520 does a good job in the system benchmark. This is also obvious in a direct comparison to the Dell Latitude E6520 laptop. The Dell Latitude E5520 notebook even has a lead on the E6520 laptop (E5520: 7029.0 points vs. E6520: 6629.0 points) in the PCMark Vantage benchmark. As expected, the Latitude E5520 can't excel with the Intel HD Graphics 3000 in the graphics benchmarks. The incorporated graphics doesn't provide any surprises in our graphics test. 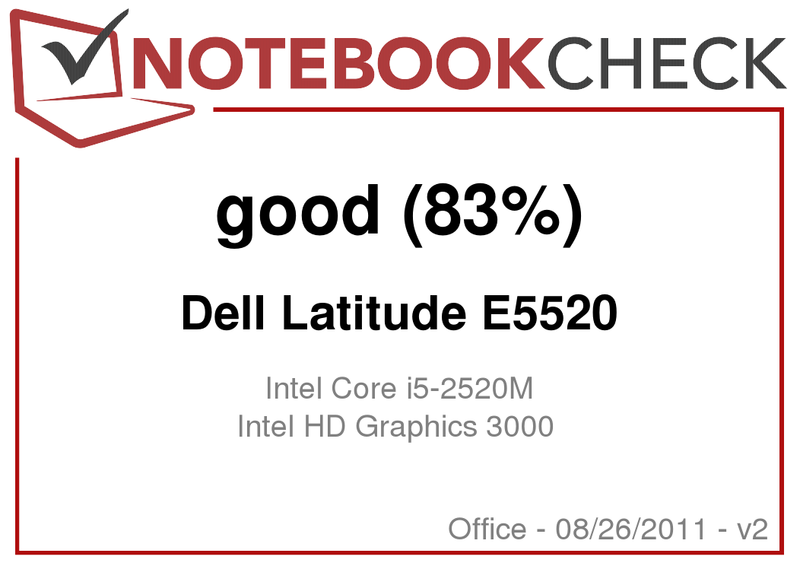 Dell's Latitude E5520 notebook is scarcely in the lower half of the chart with 4590.0 points. 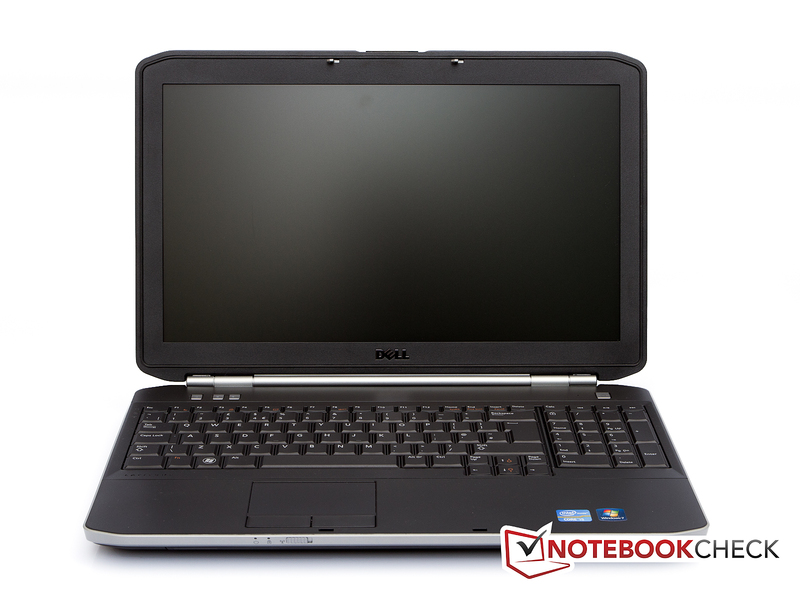 Other notebooks in the Latitude E5520's vicinity are, for example, the Sony Vaio VPC Sony Vaio VPC-SB1Z9EB (2520M, HD 6470M) with 4615.0 points or the Apple Macbook Air 13 inch 2011-07 MC966D/A (2557M, HD Graphics 3000) with 3808.0 points. The comparison to the Dell Latitude E6520 laptop shows that the Latitude E5520 doesn't have to hide here, either. While the Latitude E6520 still has the lead in the 3DMark05 benchmark, the Latitude E5520 surpasses the E6520 in the 3DMark06 benchmark. A 2.5 inch hard disk from Western Digital is used in our Latitude E5520 test sample. The WD2500BEKT-75PVMT0 has a (gross) capacity of 250 GB and a speed of 7200 rpm. It's not particularly fast with an average transfer rate of 73.1 MB/s. Merely the access rate of 17.6 milliseconds is slightly below hard disks with a speed of 5400 rpm. The Latitude E5520's system noise can vary greatly depending on the application. The noise level is 30.5 dB (A) - 40.9 dB (A) conditional on the degree of load. As long as the fan is turned off, the noise level is 30.5 dB (A) - 30.6 dB (A). The noise level increases to 40.9 dB (A) as soon as the fan is enabled. The laptop's DVD drive generates a background noise level of 34.6 dB (A). The drive attracts attention with a quiet whir during movie playback. 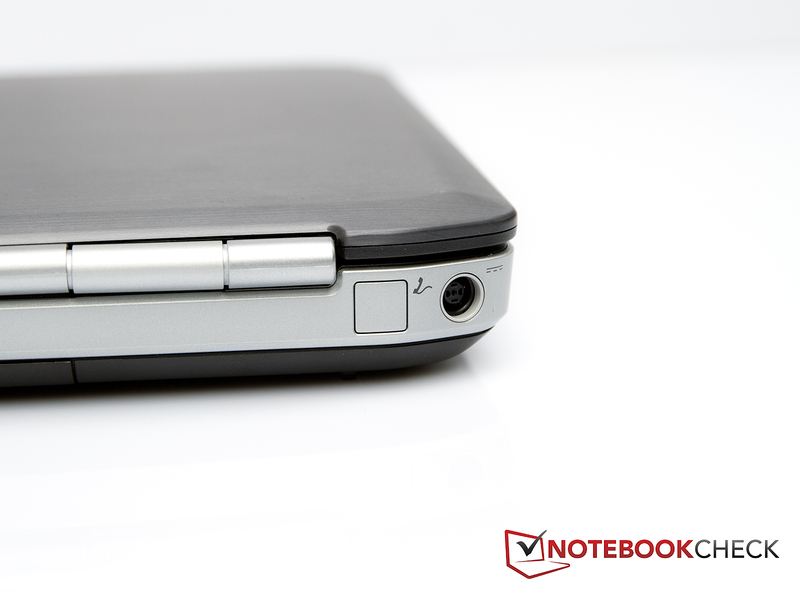 The notebook's noise level is 43.5 dB (A) - 43.7 dB (A) when the cooling system turns up to full. Then it is very audible and could be found disturbing in quiet surroundings. The Latitude E5520's temperatures are all uncritical in idle. The base unit's top reaches a maximum of 32.6 degrees Celsius. The wrist rest reaches a temperature of 30.2 degrees Celsius (left) and 27.4 degrees Celsius (right). The touchpad's temperature is 31.7 degrees Celsius. The maximum temperature on the case's bottom is 36.2 degrees Celsius. There aren't any problems in idle mode. The notebook can be used on the lap - even for a longer time. As expected, the temperatures increase during load. The maximum temperature on the case's top is 45.6 degrees Celsius. The wrist rest now has a temperature of 41.2 degrees Celsius (left) and 31.4 degrees Celsius (right). The touchpad's temperature is 45.3 degrees Celsius, which is unusually warm for an input device. The maximum temperature on the case's bottom is 47.3 degrees Celsius. This may be uncomfortably warm for many users when used on the lap and use on the thighs is no longer to be recommended. However, a full load notebook use on the lap will hardly ever be the case. Strangely enough, the maximum temperatures are always reached in the laptop's center. 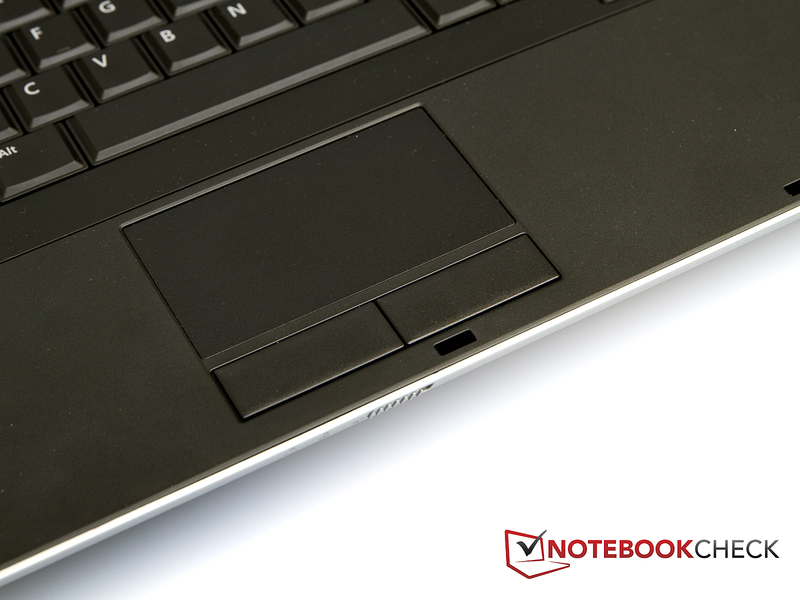 The warmest areas on a notebook are usually directly in the vent's vicinity. We simulate full load operation with both programs, Prime95 and Furmark. 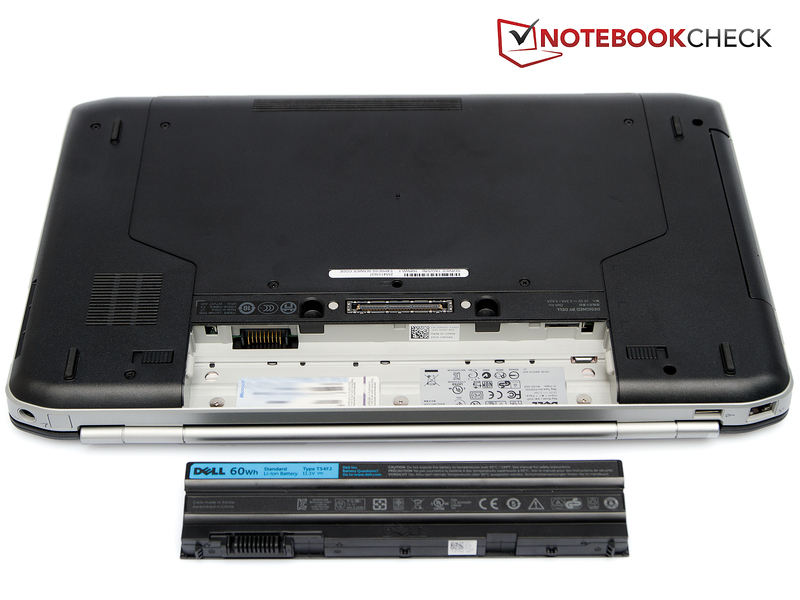 They push the notebook to its load limits and the cooling system is fully exhausted. The temperatures are all within an acceptable range. The processor reaches a maximum temperature of 89 degrees Celsius according to CPUID Hardware Monitor. We didn't notice processor throttling during the stress test. 3DMark06, executed subsequently, also didn't show any signs of performance decrease. (-) The average temperature for the upper side under maximal load is 38.7 °C / 102 F, compared to the average of 29.4 °C / 85 F for the devices in the class Office. (-) The maximum temperature on the upper side is 45.6 °C / 114 F, compared to the average of 33.9 °C / 93 F, ranging from 21.2 to 62.5 °C for the class Office. (+) In idle usage, the average temperature for the upper side is 29.7 °C / 85 F, compared to the device average of 29.4 °C / 85 F.
(-) The palmrests and touchpad can get very hot to the touch with a maximum of 45.3 °C / 113.5 F.
(-) The average temperature of the palmrest area of similar devices was 28.2 °C / 82.8 F (-17.1 °C / -30.7 F). The loudspeakers are equal to those in other notebooks and supply a rather thin sound. There are no basses or low pitches at all. Since the Latitude E5520 has rather more been conceived for business customers and not designed as a multimedia laptop, it is quite tolerable. Nothing speaks against an occasional movie playback. The sound quality is sufficient for that. The notebook's power consumption behaves pretty much like in system noise. The consumption range of 8.2 watts up to 13.1 watts in idle is pretty high. 8.2 watts is a good rate for a laptop with this configuration. 13.3 watts are sooner midfield. The rates also diverge strongly during load and fluctuate between 32.7 to 68.7 watts. The consumption is 54.5 watts when only the processor is put under load, for example with a program like Prime95. For one thing, the 60 Wh battery has an effect on the battery life and for another the hardware's numerous energy saving mechanisms. The Dell Latitude E5520 lasts for a whole 8 hours and 29 minutes without AC power in idle. The brightness is still bright enough to work comfortably in its lowest level. In any case, the battery lasted for almost 5 hours in our WLAN surf test. If you want to watch a DVD on the go, you have 4 hours and 11 minutes to do so. The battery life sinks to 1 hour and 17 minutes only when the laptop is really loaded and the power saving mechanisms don't take effect. 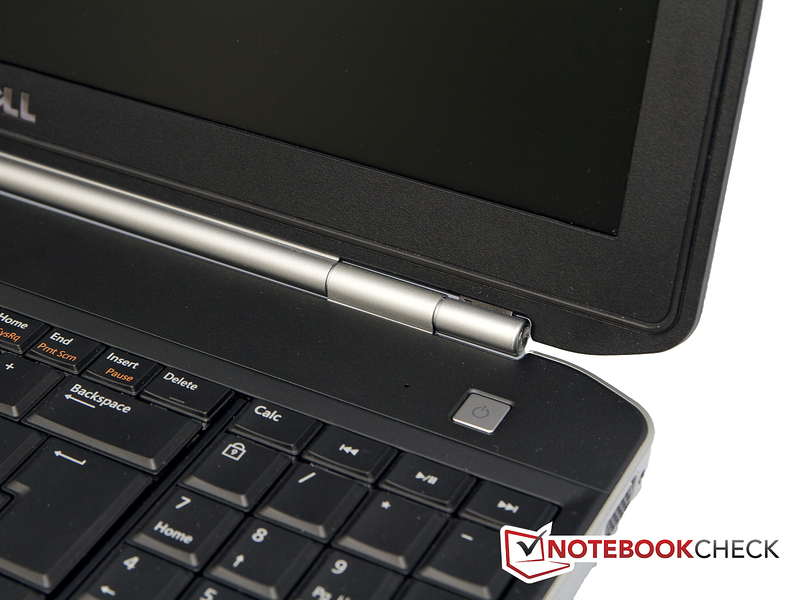 The Latitude E5520 is a worthy expansion of Dell's business notebook range. First rate input devices in connection with the high-end and plain design make the Latitude E5520 to a solid office laptop. The strong Intel Core i5 processor from the Sandy Bridge family gives the notebook a good measure of performance and also allows gaming on the laptop. The matt display can excel with its good brightness. Moreover, it is very suitable to work outdoors. While no compromises have to be made in the shade in terms of displayed content, only minor interferences turn up in direct sunlight. It's a bit too bad that there's no USB 3.0, but the Latitude E5520 at least has a docking port on the bottom so that it can be coupled to a docking station. This enables you to expand the connectivity and provides a cleaned up desk. 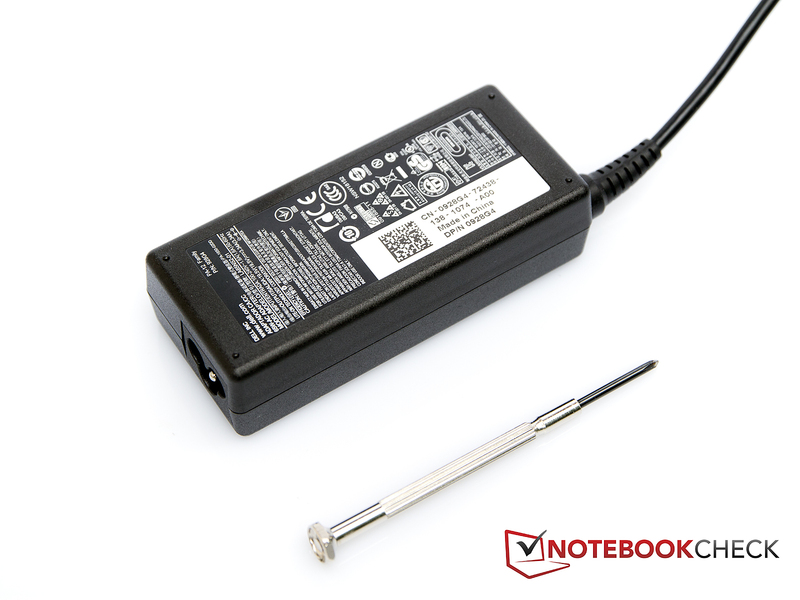 The 60 Wh battery makes the Dell Latitude E5520 to an enduring companion. If you only put the laptop under little load, it can even accompany you through an 8 hour workday. 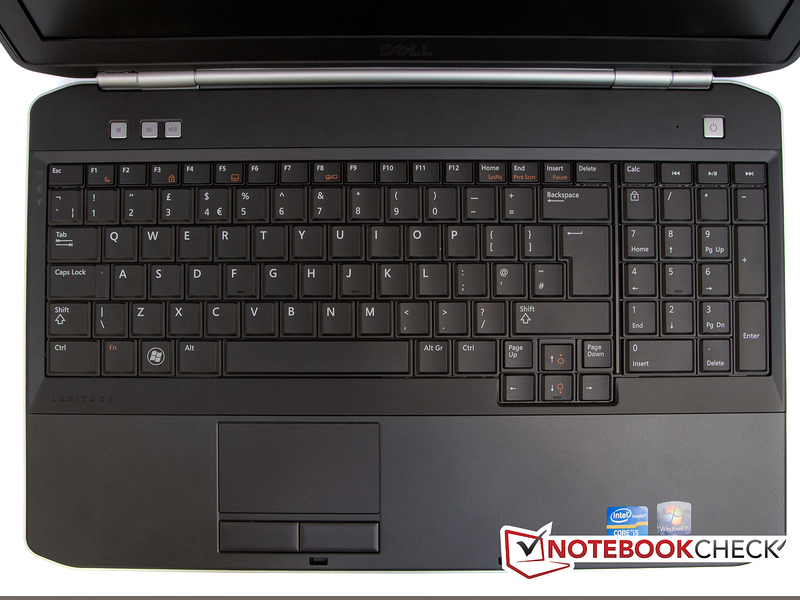 Overall, the Dell Latitude E5520 is an able business laptop with only few real flaws. The omitted webcam is a bit unusual. There's even room for expansions. You could even exchange the processor. ... you can access all relevant hardware components. The opening for the 56k modem is sealed in our test sample. In return, it has metal hinges. Dell has saved on function keys outside the keyboard. A plain, but elegant work notebook. Display lid made of brushed aluminum. The adapter is agreeably small. The elegant design and the great variety of connections are likely to make a good impression in many offices. The new USB 3.0 port. The Latitude E5520 would be well equipped for the future with that. Why not more manufacturers install such good keyboards in their notebooks. The HP ProBook 6550b still has a processor from the previous Core processor generation, but can definitely be seen as an opponent for the Dell Latitude E5520. The HP laptop especially scores in terms of display. But a look at Dell's other models wouldn't hurt. You get a bit less power with the Dell Latitude E5420 Essential laptop, but the notebook compensates that with portability. 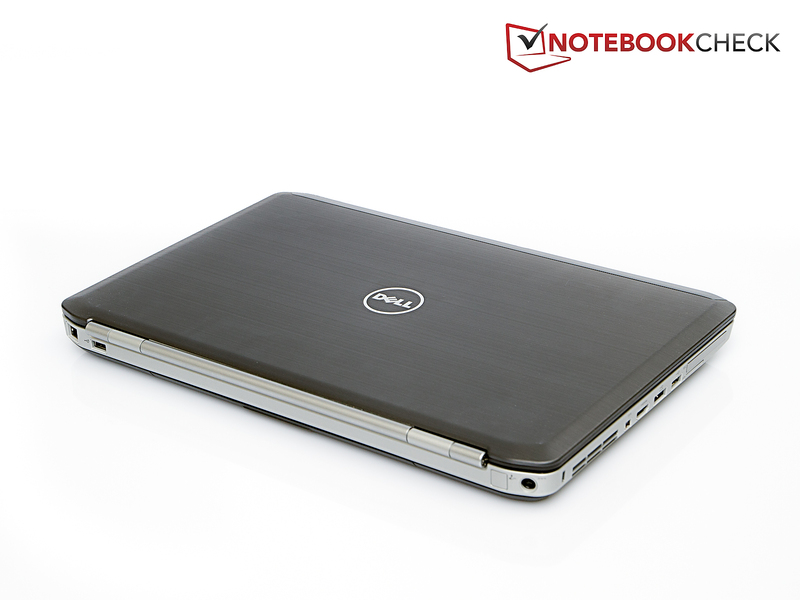 If you put more value on workmanship, you should take a closer look at the Dell Latitude E6520.